The Learning Links catalog can be sent to you free. Fill out our online catalog order form or call us at 800-724-2616. Alternatively you can download our catalog in PDF format. To download the catalog, option-click on the catalog cover image below and the file will start downloading (Mac OS), or right-click the image and choose "Save Target As" (Windows). Tip: To search for a title, click search in the PDF window. 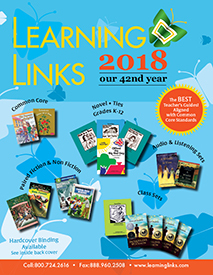 The 2018 Learning Links catalog contains the full range of books, teacher guides, and educational collections that we offer. Use the image to the left to view or save the PDF, where you can either view all of our products via Adobe Acrobat or print off the pages you need.